Most of your interaction with VoiceOver will involve the use of keyboard shortcuts, and many of these shortcuts will include the Control and Option keys. 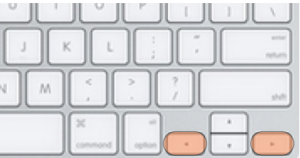 These keys are known as the VoiceOver (VO) keys. 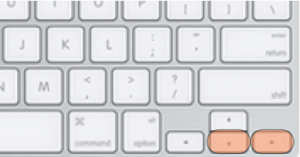 Quick Nav is a new feature in Mac OS X that allows you to navigate without having to use the VO keys. 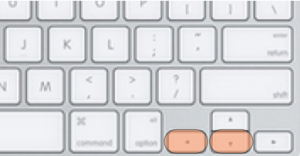 Quick Nav uses the arrow keys arranged as an inverted T on your keyboard for navigation. Turn Quick Nav On/Off: press the Left and Right Arrow keys at the same time. Interact with an item (the equivalent of pressing Control, Option, Shift, Down Arrow): press the Down and Right Arrow keys at the same time. Stop interacting with an item (the equivalent of pressing Control, Option, Shift, Up Arrow): press the Down and Left Arrow keys at the same time. 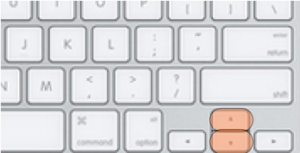 Make a selection (the equivalent of clicking with the mouse): press the Up and Down Arrow keys at the same time.